Slots quotas allow you to set posting limitations based on posting slots. With some job boards you don't pay for individual posting, but you buy "posting space" called slots. This means you can have a certain number of jobs live on the board at the same time, but you can add as many more as you like, after the old ones expired or have been deleted. As slots quotas setting tracks your number of live jobs (please remember to delete via idibu to keep the posting figures up to date), it allows you to assign maximum posting amount to your consultants for this type of boards. You can i.e. assign your 4 consultants 5 slots each on a 20 slots account. TO KEEP YOUR SLOTS SYNCHRONISED AND UP TO DATE IN ADPOST, PLEASE NOTE YOU WILL NEED TO USE ADPOST TO DELETE OR ARCHIVE ANY ADS. 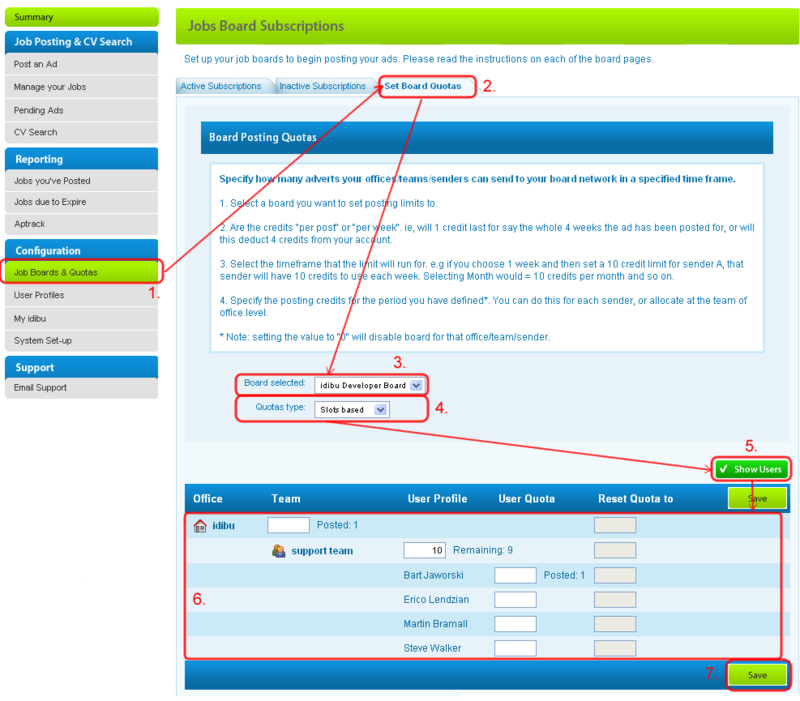 SHOULD YOU DELETE ANY ADS 'DIRECTLY' FROM YOUR BOARDS, ADPOST WILL BE UNABLE TO SYNCHRONISE YOUR SLOTS QUOTA. SHOULD THIS HAPPEN AND YOU REQUIRE US TO RE-SYNCHRONISE YOUR QUOTAS, THERE MAY BE A CHARGE. Click "Job Board and quotas". Select the board you wish to set the quotas for. Select "Slots Based" as your quota type. Assign our quotas. You can assign the maximum posting number to you offices, teams and particular consultants. Please mind that setting "0" as quota prevents access to the board.